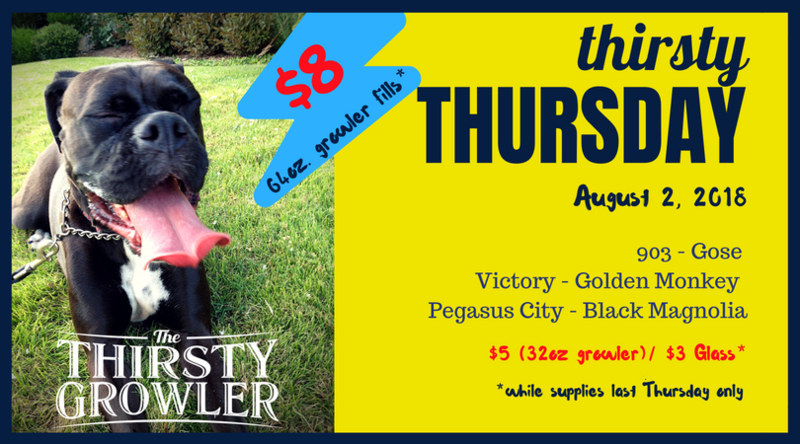 🍻 Thirsty Thursday + Upcoming Events at The Thirsty Growler! Don't forget to bring your growlers and fill them up with these specials! Don't forget, we have a great bottle list that is for both onsite and offsite consumption! Yes, you can get them to-go so definitely check out our list on your next visit! Tackling Alzheimer's! - Friday, August 3rd @ 6:00pm - Join us for a great night of fundraising! We're tackling Alzheimer's one beer at a time. COOP, 903, Community, Odell, and Bowls and Tacos are joining the fight against Alzheimer's with The Thirsty Growler this Friday night. Join us for beers, tacos, and an impressive silent auction with some super nifty prizes. It's a night you simply won't want to miss! Every $25 donation gets you a ticket to the BvB Dallas powder-puff game and after-party held on August 11th at the Cotton Bowl. 100% of proceeds will go towards the BvB Dallas Alzheimer’s fundraising efforts of Audrey White. Epic Event - Saturday, August 4th @ Noon - We are very excited about this one! We received a very limited number of Baptist Reserve bottles that will be served in 5oz pours. In addition, we are pouring Baptista, Triple Barrel, and Big Bad Baptist that will make for one Epic flight! The Reserve will not last so I urge you to come out for this one if you love these Baptist variants. Vinyl Mondays at TTG - Monday, August 6th @ 6:00pm - BYOV and enjoy some tunes from DJ WinnieBago! Delayed opening - Monday, August 6th @ 5:00pm - We are taking our employees out for an employee appreciation event and will be opening the tap room at 5:00pm. Don't worry! DJ WinnieBago will be there in time to play those vinyls for you all evening. Copyright © 2018 The Thirsty Growler, All rights reserved.